The Adventures of Scott & Caroline: Hasta Luego, Cuba! 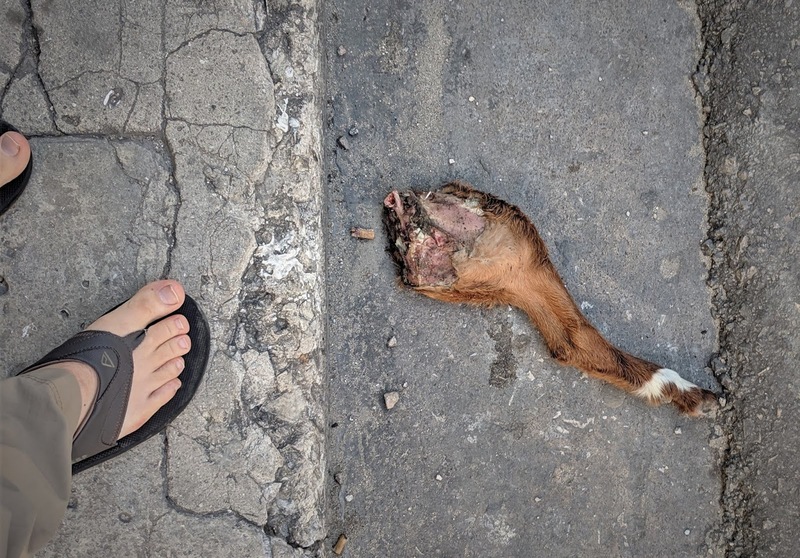 Just another random goat leg in the street on the way to the peluqueria...nothing to see here folks, just keep moving along. Well, the week went by quickly, no doubt due to our busy days on the tour. 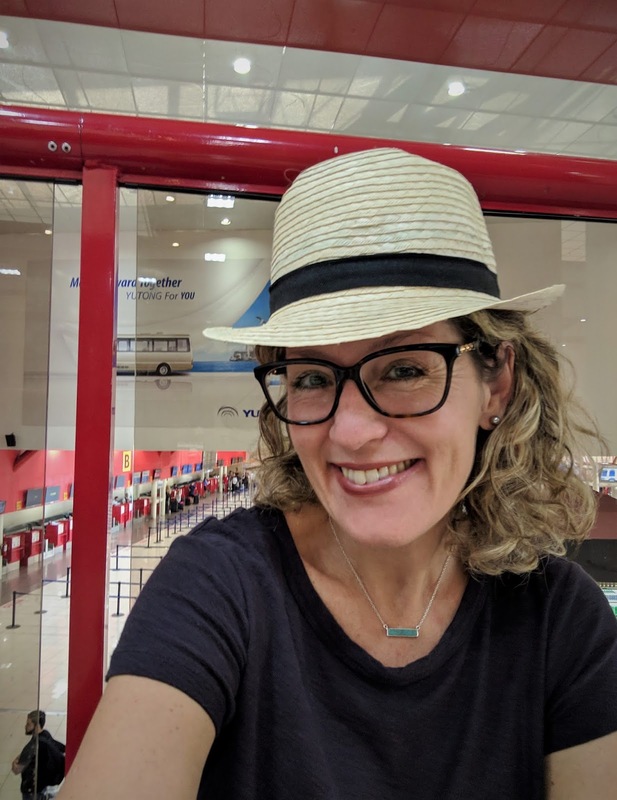 This morning we'll have just enough time for breakfast, packing, and a final quick lunch-snack before retracing our flight via another tight connection in San Salvador to SFO. Breakfast was on the top floor of our hotel, the Hotel Capri, which had some really nice views of Havana in all directions. It was a perfect day, sunny with temperatures in the low 80's, and easily the nicest-weather day we spent in Havana, which made leaving just a little bit harder. I had been scoping out peluquerias (i.e. barbershops) all week, hoping to find some time away from the group to get a trim before heading home. We passed a couple earlier in the week walking down Neptuno toward Havana Vieja, so I thought I'd try my luck there. Getting haircuts in foreign countries is one of my favorite things to do. 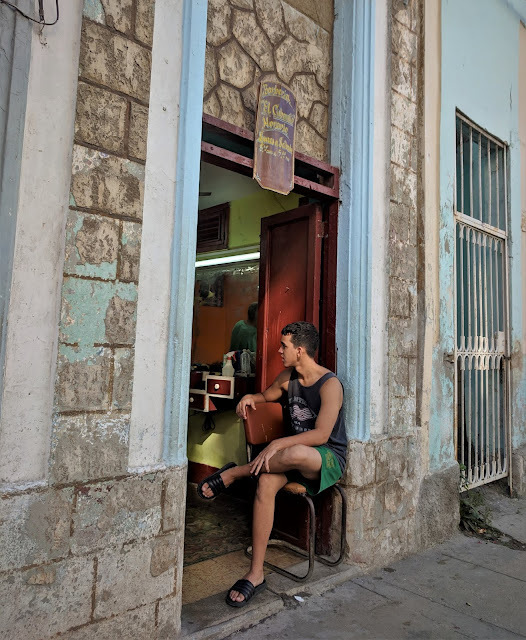 As it's not a popular tourist activity, going into an off the beaten path barbershop always gives you some super-local flavor, and the barbers seem to appreciate the business (I'm sure I usually get the foreigner's price, which is still dirt cheap compared to a Supercuts back home). Eventually I was able to find myself a place - a single-chair hole in the wall that was open on a Saturday morning, and one that took CUCs (or at least he would this morning). I waited for about 5 minutes before he decided to kick the current customer, a taxi-driver and clearly a friend of his, out of the chair so I could have a turn. I listened to some arguments about baseball and futbol players' salaries, and got a mighty fine trim. As I left, the taxi-driver plopped back down to let the barber finish the job. We were going to head back to Los Amigos for a final quick bite before heading to the airport, but we found them closed, and landed at a little cafe directly across the street from our hotel for a final rum and lunch. 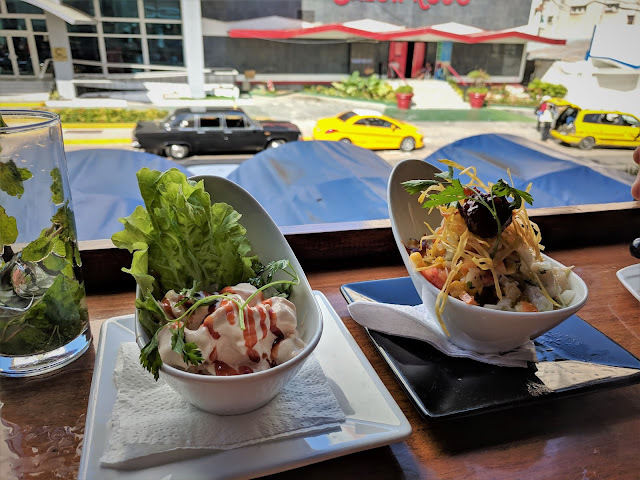 Ceviche (delicious), stuffed plantains (so-so), and a shrimp cocktail, which was a bowl of salad shrimp coated in a liquid-y mayonnaise. Did we mention they love their mayonnaise in Cuba? 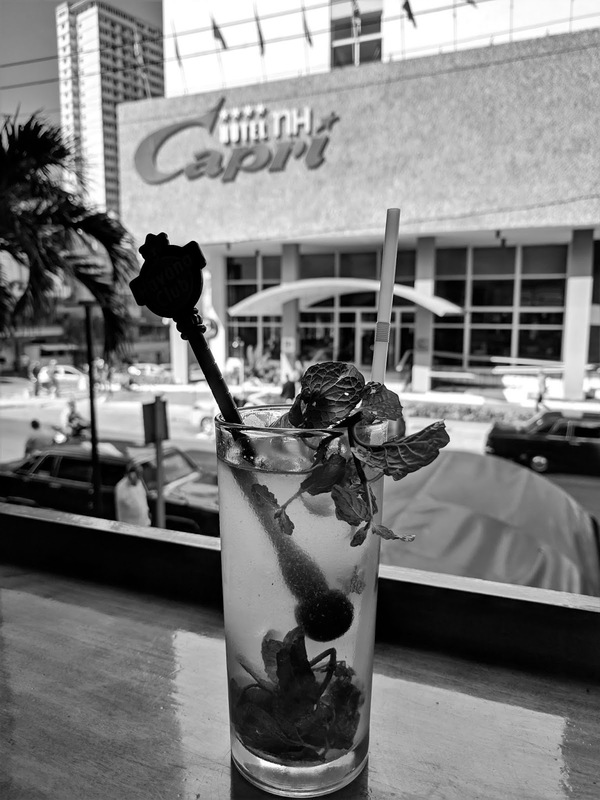 At least the mojitos and Havana Club 7-year were good! Linett and our bus driver were waiting for us, as their sole job for the day seemed to be driving us to the airport. Two of our tour-mates had a flight back to LA before us, so we carpooled and got there with plenty of time to kill, which really just involved sitting on the floor of the airport waiting until they'd let us go through security. We noticed Linett seemed to be shopping at the airport, maybe they've got a better food selection than at the local grocery stores. A smooth and uneventful trip home, we were snug in our beds by 2am and ready to sleep for days. I think it's safe to say we both had a good time in Cuba. It wasn't quite like any trip we'd ever taken, but probably closest in experience or feeling to our trip to Nigeria. Was it 'fun'? Sometimes. It was always quite interesting. We learned a lot, but more just from looking around us, as the guides' information always seemed like it could use some fact-checking. Not quite a vacation, but not really like independent travel, it had an in-between sort of quality. While it was nice not having to think up an agenda or find places to eat and sleep, we definitely don't plan to travel on a tour again any time soon. 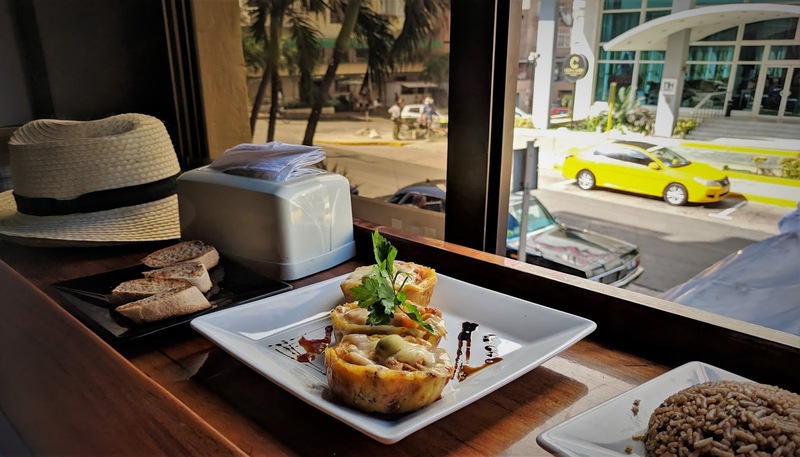 As Caroline aptly put it, being on a fully guided tour, with little to no time to look around for ourselves, really took away the joy of discovery that is a hallmark of our typical travel adventures. It may have been the way to go in Cuba for American tourists though, unless you've got plenty of time for research, arranging transit, etc. We both would love to go back in the future, if things open up a bit more and we can more easily travel independently. Maybe someday. 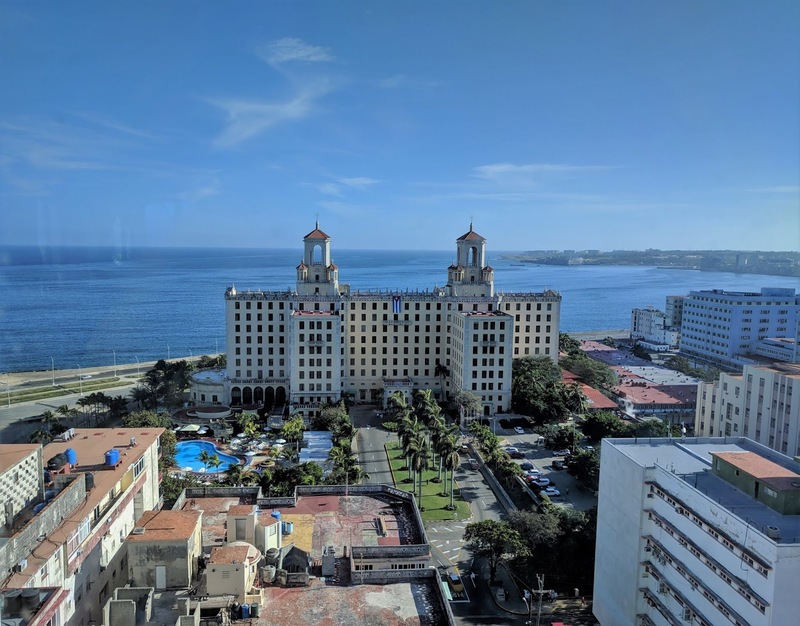 The view from the breakfast room at our hotel, with the historic landmark Hotel Nacional front and center. If only the food were that good! The "shrimp cocktail" doused in a mayonnaise-y sauce (left) might be the only menu item of the entire trip that Caroline refused to try. The ceviche (right) was super delicious! The stuffed plantains looked pretty weird but the combinations of cooked plantains, pork, cheese and olives was a winner in Caroline's book! Yum! Cuba - To the Hills! Happy Holidays from the Brookses!